Convey your heartiest festive wishes to your loved ones by sending them thoughtful text messages. Read on for SMS on Janmashtami. The pious festival of Janmashtami is held in high reverence by all Hindus no matter in which part of the world they live in. 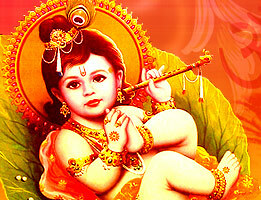 The festival marks the birthday of Lord Krishna, who is believed to be the eighth incarnation of Lord Vishnu. Lord Krishna is one of the most beloved and endeared deities of Hindus since his life and teachings, till date, enlighten the path of righteousness for one and all. On the eve of Janmashtami, friends and family get together at various temples to offer special prayers to the Lord. Temples echo with sounds of devotional bhajans and chants, where devotees sing and dance in their devotional fervor. If you wish to pass on some good wishes of Janmashtami to your near and dear ones, then browse through the list of Janmashtami SMS given here. and it will belong to some one else tomorrow. Don't be baffled by maya. 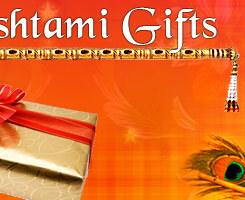 Janma' means birth and 'ashtami' means the eighth. second fortnight in the month of Shravana. Celebrate the Birth of Krishna...! and the enlivener of the cows and the senses." mubarak ho apko janmasthami ka tyohar..
Shri Krishna ki kripa aap par sada bani rahe. to aao apne ghar ko hi gokul banaye..
Shri Krishna Janmashtami ki hardik badhai..